Frankie and Clover's Strictly Come Dancing Blog! : A Close Encounter of the Strictly Kind....Part 5! Well here we go again off on another Strictly adventure, can you believe we're up to part five of these?! I won tickets for the show via the BBC ballot and took my lovely friend Layla along for the ride as Clover couldn't make it. It was a very long day with about 12 hours at the BBC in total, but it was oh-so-very exciting! After much advice on Twitter we decided the best time to get there was about 11am and as we rocked up with bags of food and heels in our handbags we discovered there were only about 40 people ahead of us in the queue AND we were the last people to be able to stand under the minimal amount of shelter, score! Thankfully not too cold and we could wander off to Westfield one at a time; I must give a shout-out to the lovely woman who let me sit in her husband's chair for a while! We were let in at about 3pm in the end and had our phones whisked away from us pretty much straight away, which was rather traumatising! First we had Neil Diamond recorded; he sang live and pretty well at that. However, I was mainly distracted by the fabulous Robin and Kristina. This is also the point in the evening when you realise how much clapping you'll be doing the whole time, my hands hurt so much by the end! So after a few pre-recorded clips and judges costume changes (Bruno took longer than Alesha! ), the show started. Being near the stairs meant we saw most of the outfits pretty close and they were so spangly and cool. I won't do a full run down of all the dances like usual as this would be a huge post, plus I feel like I watched a lot of the dances backwards from where I was sitting. Flavia and Jimi were a great way to open the show and we were gasping away at the fast footwork, but the windows were lost on us as we were behind them! Next was Scott and Natalie who I was very impressed with, the tango routine was great and there was a lot of menace from Scott, who is much hotter in real life! 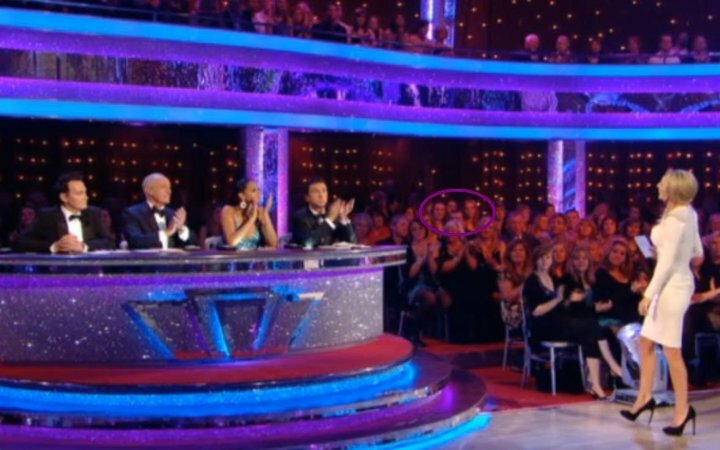 Plus Natalie's parents were in the audience - neither of them are as tall as you might think! Moving on to Tina and Jared, they really are teeny tiny and her dress was super-cute as well. Thought this was a pretty good Charleston and they very well with the song choice. Couldn't see any pox on her, but maybe you could on screen! Felicity and Vincent's tango was a treat, when they were preparing to start we thought they were bringing out cocktails for the judges to drink! I got a pretty good view of 'The Kiss' actually, very exciting! Her dress was also much more sparkly up close. Katya totally won the best dress of the night, totally inspired by Kelly Brooke's tango dress. The gloves were fabulous too. This wasn't the world's worst tango, possible slightly undermarked but not dramatically so. Len was right about his facial expression, he did look nervous throughout the whole thing. Speaking of dresses, when Erin was dancing her Charleston with Peter we could hear the sequins on her skirt clicking together! You do not get that at home! Alas, when the dance ended I did turn to Layla and say without the song that would have been a shambles. Peter was never going to be good at this, but he did give it his all. The gloves were a mistake though, they made his hands look HUGE! James and Pamela's tango was fab-u-lous! Even with James' satan beard and my dislike of leopard print I thought this was a great dance, I can't wait to see this woman do a paso! Matt and Aliona's Charleston was also amazing and you will never see a more sparkly unicycle! When Bruno gave it an eight I think it got the biggest boo of the night from the audience. And then came the man we have been missing, Ian Waite appeared looking as tall as ever, Michelle looked quite petite next to him. I think this might have been her best dance, although I do confess I was mostly watching Ian. With Artem and Kara we thought she was slightly undermarked, the judges said it wasn't as funny as the others, but that wasn't the point of the routine. It was more cool and jazz and she did it really well. And then came flying Ann, we simply could not stop laughing when you added Anton flying himself around the dancefloor on his own. Plus big points to all the people running around getting Ann in and out of that harness without being on camera. So that was it, as an extra treat about half the celebs came off stage and walked right past where we were standing! I feel I must apologise to Pamela Stephenson for pretty much shrieking "well done, we love you!" right in her face! Also saw Michelle and Patsy AND Billy Connolly waked right past us too, managed to restrain ourselves thankfully and not scream at the poor man. Then it was the break from the VERY hot studio, when we came back we thought it might not be as exciting as the rest of the show - how wrong we were! Some people had not come back, probably had to catch trains or something, and the floor manager moved us to the fourth row right behind Tess! After much OMG-ing at each other, we had totally forgotten that whilst we had already seen the amazing Argentine Tango being filmed there was another pro dance to come! And what's more it was the GI-themed jive from the pro tour! Oooh men in uniform! This was probably the best thing we saw all night and we were practically jumping out of our new seats. The results part was quite tense watching everyone line up, thankfully we were given a good bit of light relief from the delightful Claudia. She had very shiny hair and very high shoes this week. How we loved her. After the results we loitered and waved at various celebs and eavesdropped on Matt talking about how tired he was but eventually we were forced out by the BBC people. I tried to take a photo inside the BBC doughnut as we were leaving and who walked right across it but James! And thus the immortal quote 'James Jordan you are ruining my photo!' was born. Wow! That sounds like it was great fun! Sooo jealous. I love your blog. Your writing is so fun to read.. I think I will visit again.